Well it's a new month, hubby has gone back to work, I'm adjusting to being home alone with the two little ones, and just getting brave enough to do little short trips out with both of them. Little Man is one month old and loves tummy time! In April last year, I had the pleasure of interviewing Cindy from Your Kids OT (you can read it here). It's so wonderful when other experts in the area of Early Childhood can contribute their knowledge to Teacher Types, and today Cindy is sharing her tips on how to go about 'tummy time' with new little babies. 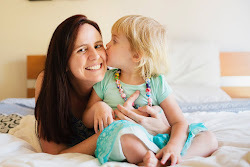 A great post for new parents, or a refresher for second, third or fourth time around parents! Thank you and welcome Cindy! “Back to sleep, tummy to play” was coined as a response to encouraging parents to lay their babies to sleep on their back to help reduce the risk of SIDS- Sudden Infant Death Syndrome or "cot death". Tummy time encourages a baby with the development of head, neck and upper body muscles. This development is so important as baby learns to roll over, sit up, crawl, stand and walk. 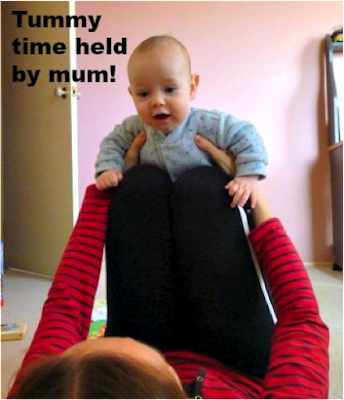 All these activities need baby to have the strength to support themselves against gravity and develop postural tone. Tummy time helps them to understand how to weight-shift and over time use both arms at the same time (bilateral coordination). Weight bearing on baby’s arms and hands is an important benefit of tummy time and crawling that can be sometimes overlooked. Tummy time also helps to prevent the development of flat areas on the back of their head. Here are some tips to get started with tummy time! Start with 1 or 2 minutes. Allow sufficient time after a feed. If baby falls asleep, gently turn them over onto their backs. You can increase the time as baby gets used to this position and develops strength. There are no rules on time, however aiming for 10-15 minutes across a day is a good start. Remember to help baby to turn their neck so they alternate the cheek down. You may also want to check out some more photos of tummy time positions here. A baby should never be left alone during tummy time and you can use this opportunity to interact with your baby. Trying the positions which place baby on you as a parent. If they are lying on their own, get down with them onto the floor or ask a sibling to lie down with baby! Sing, talk or just gaze into their eyes. Provide toys or a non-breakable mirror for them as they get older and start to use their arms to push up. Turn a book or read your magazine so they can fix their eyes and develop visual tracking skills whilst on their tummy. It’s true that not all babies like tummy time but don’t give up! Remember the previous 3 tips and take a break. Try again. As a therapist, I have to often re-introduce tummy time to older babies and even young children. They may have already achieved some developmental milestones; however they struggle with other motor skills or postural tone (eg. they need to lean against furniture when sitting on the floor, they have to hold their head when writing at the table). Tummy time should not be a chore. It can be enjoyable and your baby will love the interaction they have with you. Do you have a tummy time tip for new parents? Cindy is a registered Occupational Therapist practising in Sydney Australia with over 15 years experience. She has two young children who are a constant source of inspiration and learning. Cindy loves working creatively to help children to reach their potential, finding opportunities in everyday living and making learning fun. 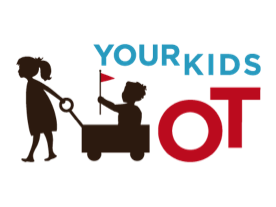 Cindy is the author of the Occupational Therapy blog Your Kids OT.